Michael Anthony Frier was born March 20, 1969 in Jacksonville, NC to the union of Annie-Jane and Ulysses Frier. Mike attended Jacksonville High School where he received a scholarship to play football at Appalachian State University, also studying in Communications. From there, Mike was a 7th round NFL draft pick for the Seattle Seahawks. He also had the honor to play for the Cincinnati Bengals before returning back to play for the Seahawks. 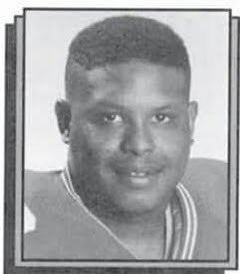 Shortly after, his football career ended in 1994 when he was involved in a life changing car accident that left him paralyzed from the neck down. Nothing in this world stopped Mike from being the best father and son that he could ever be. Growing up, Mike loved music and had dreams of becoming a DJ. Many childhood friends remember him as DJ Word. As Big Mike grew older, he earned the nickname “Supasize”. After establishing himself in Atlanta, GA, he started up his own entertainment company “Supasize Entertainment” where he owned his own studio in his basement and worked with local talent. Mike spent most of his time listening to music, watching classic movies, having sport-related and current event debates over social media, playing video games, and being with his daughter. He also enjoyed investing his time into reading and feeding his mind with knowledge on a daily basis. Mike is preceded in death by his mother; Annie-Jane Dixon, his maternal mother; Beatrice Grice Poindexter, his brother; Kumonie Brown, and uncle Rufus Davis. He is survived by his father Ulysses Frier and step-mother Betty Frier, Jacksonville, NC. His daughter Mik’kell Frier, her mother Kelly Butler, grandson Kayden Michael Patrick and son-in- law Katlin Patrick, of Atlanta, GA. Six brothers; Russell Frier, Milwaukee, WI. Harold Frier, Jacksonville, NC. Leon Grice, Winston-Salem, NC. Anthony Peake, Richmond, VA. David Mcneil, marine of Camp Geiger, NC. Robert Mcneil, army of Fort Lee, VA . Three nieces, Ashley and Alexandria Grice, both of Winston-Salem, NC. Kearstin Russell-Peake, Richmond, VA. One nephew Jonathan Grice, Winston-Salem, NC. Biological grandmother Madgie Grice-Jones. A host of aunts, uncles cousins, and lifetime friends. The family of Michael would like to thank friends, family, and friends of the family for their condolences, love, and support during our difficult time of loss. A special thank you to Rev. Joel Churchwell and the entire church family for allowing us to celebrate Michael’s life in their church home.